ABAP development is very critical in addressing any solution gaps, custom development on any SAP project. It is very important to know a lot of diverse programming aspects during a SAP accomplishment project and follow certain guidelines that can make an SAP ABAP professional very successful in your career. To be a successful ABAP developer you should have thorough knowledge on it. For this, you need good SAP ABAP training. Step 1: The first part of any ABAP development project starts with meeting the users or business experts and understand the business needs that need to be implemented in SAP system. The best approach is to conduct a workshop to gather all the business needs. After all the business requirements are gathered, a SAP functional consultant or a business expert will write down a complete functional specification. A well-defined functional specification must include test case scenarios or UML diagram. Step 2: In an ideal case, the ABAP Development Manager should have created a programming benchmark and guidelines document. You need to review this document. You can learn the naming conventions for function modules, dictionary objects, classes, namespaces, different software components, proxies, program input and output parameters etc. 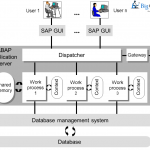 Step3: Test case documents are written by the functional SAP consultants in most of the SAP implementation projects. But on some implementation projects, a programmer may be needed to write test cases. Before writing a test case reviews the functional specification document is thoroughly checked the written test case with the users. Step 4: You need to read the functional specification and create the list of all the development objects that would be required to implement the specified functionality in the SAP system. You need to draw a flowchart and review with experts. The technical design document should comprise technical overview, ABAP objects that can be reused, list of new database objects, data model, and class diagram. Step 5: In this step you should realize the specification of the ABAP development. Step 6: A good SAP ABAP development practice is followed throughout the development lifecycle of the project. Step 7: One should check and test code after completion. You need to verify the results are same as the expected or not using specified test cases. Step 8: You need to write a user document with all the functionalities.